The article in attachment LA-Phoenix110809 originally appeared in the November 8, 1909 Indianapolis Star. The dateline was Ahrenburg, Arizona. This is a misspelling, it is actually Ehrenburg. The article is a mid-race report on that year's running of a classic auto race of early 20th Century - the Los Angeles-to-Phoneix race, also known as, "The Cactus Derby." The contest would eventually be won by driver Joe Nikrent. This report provides no drivers' names but shares the status of cars in the race at the 243 mile mark of the 419-mile race. There were ten cars in the contest and each started from Los Angeles one at a time and 15 minutes apart. A Buick was leading at Ehrenburg despite the fact that the Isotta that started first arrived first. The Isotta had been the first car released from Los Angeles. 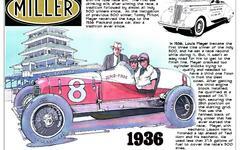 A Pennsylvania racer was in third place with a Columbia and a Studebaker following. The leading Buick reached Ehrenburg in 12 hours and seven minutes.